Location of Woodworth in Rapides Parish, Louisiana. Woodworth is a town in Rapides Parish, Louisiana, United States. 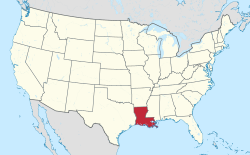 It is part of the Alexandria, Louisiana Metropolitan Statistical Area. The population was 1,080 at the 2000 census. This town is growing rapidly with a number of residential subdivisions under development. Woodworth is emerging as a bedroom community for nearby Alexandria, to the northeast. Louisiana State Senator Joe McPherson resides in Woodworth, as did the late State Representative R. W. "Buzzy" Graham, who operated an insurance agency in Alexandria. According to a 2007 report, Woodworth was named one of the 10 worst speed traps in the state of Louisiana. Woodworth made 61.32% of its revenue, an average of roughly $706 per capita, from fines and forfeitures in the 2005 fiscal year. Woodworth was established in 1942 under the Lawrason Act. Woodworth is located at 31°9′23″N 92°29′41″W﻿ / ﻿31.15639°N 92.49472°W﻿ / 31.15639; -92.49472 (31.156270, -92.494650). According to the United States Census Bureau, the town has a total area of 4.9 square miles (13 km2), of which 4.9 square miles (12.7 km²) is land and 0.20% is water. This climatic region is typified by relatively small seasonal temperature differences, with warm to hot (and often humid) summers and mild winters. According to the Köppen Climate Classification system, Woodworth has a humid subtropical climate, abbreviated "Cfa" on climate maps. As of the census of 2000, there were 1,080 people, 385 households, and 299 families residing in the town. The population density was 219.5 people per square mile (84.8/km²). There were 408 housing units at an average density of 82.9 per square mile (32.0/km²). The racial makeup of the town was 87.96% White, 10.46% African American, 0.46% Native American, 0.28% from other races, and 0.83% from two or more races. Hispanic or Latino of any race were 2.13% of the population. There were 385 households out of which 45.7% had children under the age of 18 living with them, 63.1% were married couples living together, 11.7% had a female householder with no husband present, and 22.1% were non-families. 18.2% of all households were made up of individuals and 4.2% had someone living alone who was 65 years of age or older. The average household size was 2.81 and the average family size was 3.22. In the town, the population was spread out with 29.8% under the age of 18, 10.7% from 18 to 24, 32.1% from 25 to 44, 19.6% from 45 to 64, and 7.7% who were 65 years of age or older. The median age was 33 years. For every 100 females, there were 101.5 males. For every 100 females age 18 and over, there were 94.4 males. The median income for a household in the town was $37,262, and the median income for a family was $41,667. Males had a median income of $30,417 versus $23,587 for females. The per capita income for the town was $16,200. About 6.8% of families and 9.8% of the population were below the poverty line, including 9.7% of those under age 18 and 9.4% of those age 65 or over. In August 2012, Caroline Dormon Junior High School was completed and ready for the new school year. Sitting on a 33-acre site off U.S. Route 165, the $6.5 million project is the first "green" school for the CenLa area as well as the first school within Woodworth city limits. The 50,000 sq ft building currently holds about 300 students . The school hold classes from kindergarten to 8th grade. Woodworth is among 250 towns and villages in Louisiana with a Mayors court as provided by R.S. 33:44l and 442. A mayors court was authorized through Municipal charters, and an act of 1772, giving a mayor the jurisdiction of a justice of the peace as to petty causes. Louisiana and Ohio have this form of court system. There has been controversy on the town being considered as a speed trap and the fact that the mayor has a conflict of interest also filling the Judiciary position. A suit was filed in one case ultimately resulting in the plaintiff being vindicated by a Louisiana appeals court. ^ "Weatherbase.com". Weatherbase. 2013. Retrieved on October 6, 2013. ^ "Woodworth School to Open". August 10, 2012. Retrieved 2013-03-12. ^ "Court Structure". April 8, 2019. Retrieved 2019-04-08. ^ "Mayor's Courts". April 8, 2019. Retrieved 2019-04-08. ^ "A Brief History of a Mayor's Court". April 8, 2019. p. 4. Retrieved 2019-04-08.